There is a vocal segment of Twins fandom that likes to advance the narrative that Mauer is not “clutch.” They're wrong. *Joe Mauer crushed a grand slam to right-center Tuesday, keying a 10-5 victory for the Twins over the Yankees. 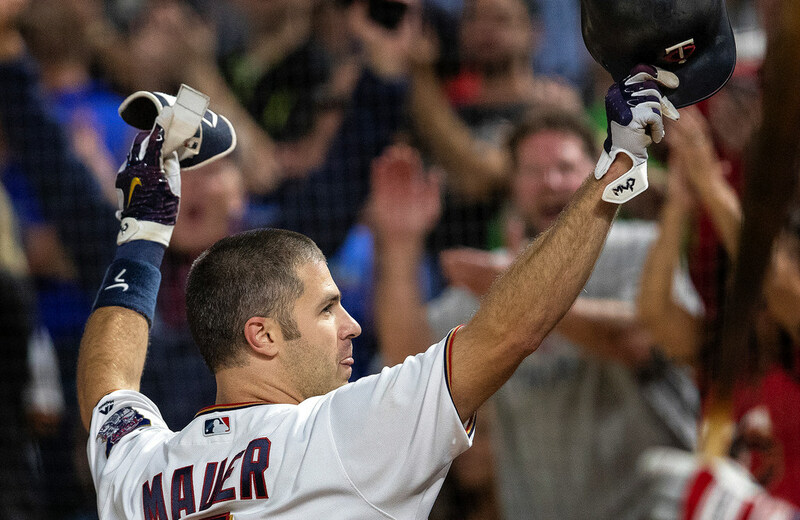 Mauer had been slumping before the hit, but the blast was a reminder of Mauer at his best: when the stakes are highest. There is a vocal segment of Twins fandom that likes to advance the narrative that Mauer is not “clutch.” The Venn diagram overlap is significant between these fans and those who knocked Mauer in his Hall of Fame trajectory heyday for not hitting enough home runs. But make no mistake: Mauer’s career numbers are indicative of a clutch performer. His career batting average with runners in scoring position is .333. As of a couple years ago, his average in that situation was the 10th-best in MLB history since 1930 for players with at least 1,000 plate appearances in those spots, and it has improved since then. His career OPS is .935 with runners in scoring position (compared to .779 with bases empty). Two outs and runners in scoring position? Mauer has a .944 career OPS. Late and close? His career on-base percentage is over .400. Of particular relevance to Tuesday: Mauer is now a .378 career hitter with the bases loaded and has a .605 slugging percentage to go with a .990 OPS in those spots. If you have to throw Mauer a strike, historically he’s going to make you pay. Even this year, as Mauer continues on a more recent modest trajectory, he’s hitting .392 with runners in scoring position. Making a blanket statement that Mauer isn’t clutch is a reflexive crutch used by Twins fans with unrealistic expectations. And it’s also factually incorrect because the opposite is true. *The Gophers sound like they’re planning to use Shannon Brooks in four games this season, an interesting — and well within guidelines — application of the new redshirt rule put into place by the NCAA. Brooks was injured before spring practice, and in normal circumstances he’d miss the entire year. But the new rule says he can play in up to four games — they don’t even have to be consecutive — without burning a redshirt. “We have a plan, and I’ll keep that plan to ourselves, but he’ll play four games by the end of the year,” Gophers coach P.J. Fleck said. When the rule came out, it figured to apply almost exclusively to freshmen. Using it to their advantage in an unconventional way could be a serious boon to the Gophers this year. *Tennis legend Serena Williams, on the heels of the controversial U.S. Open final, was in downtown Minneapolis on Wednesday morning speaking to Target employees as part of their national meeting. *Vikings defensive back Xavier Rhodes picked the seven best players in the NFC North for The Players’ Tribune, putting himself (No. 4), Harrison Smith (No. 3) and Everson Griffen (No. 6) on the list. At the top? Who else. Aaron Rodgers. *In case you missed it the other day, Vikings QB Kirk Cousins announced on social media that he and his wife, Julie, are expecting another baby boy in March.